The original version of this article, by Mike Ives, appeared on Yale Environment 360. Phan Dinh Duc leans against yellow sacks of freshly harvested rice. It’s a warm spring evening in Vietnam’s Mekong Delta, and Duc, a local farmer, is waiting for traders to arrive by truck to purchase his produce and sell it on commodities markets. Beyond him lies a vast checkerboard of rice paddies, each filled with water and bordered by a network of canals and roughly 10-foot-high earthen dikes. They enable year-round rice cultivation in an area where, a half century ago, vast floodplains typically lay fallow for half the year and farmers planted one annual rice crop that grew in tandem with seasonal floods. Here in the southern province of An Giang, a stronghold of Vietnam’s booming rice industry, yields have increased fourfold in the last four decades. The initial surge occurred thanks to the development of high-yielding rice varieties and the construction of so-called “August dikes,” which extended the end of the rice-growing season from June to August and enabled farmers to plant a second annual crop. Larger dikes built in the 1990s and early 2000s allowed farmers like Duc to plant a third crop on the same acreage. Within a generation, Vietnam has gone from a poor country where the government rationed rice and other staples, to a lower middle-income one that is now among the world’s top rice producers. But scientists say that the ongoing construction of dikes and irrigation infrastructure across the Mekong Delta and along the country’s South China Sea coastline has disrupted the river delta’s complex ecological systems. In upstream areas, for example, high dikes block the natural flood pulse and deprive downstream floodplain farms and fisheries of key nutrients. Agricultural chemicals also pollute irrigation canals and cause water and soil to acidify, which scientists say has contributed to a decline in fish populations and a general loss of biodiversity. 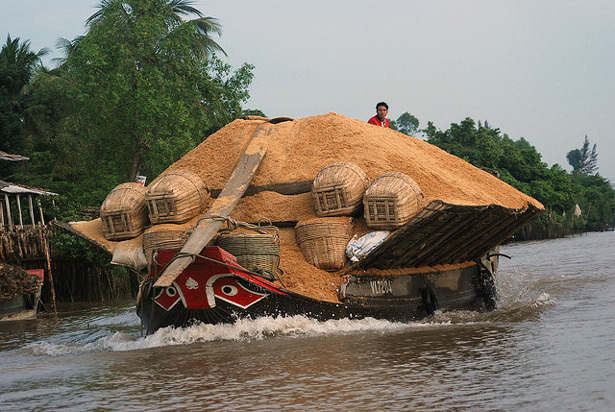 Photo Credit: Rice fluff on the Mekong, courtesy of flickr user Mor.